Fun Games to play at Pool Parties. These great swimming pool games for kids will have everyone cooled off and having fun! Great for birthday parties and summer get togethers. 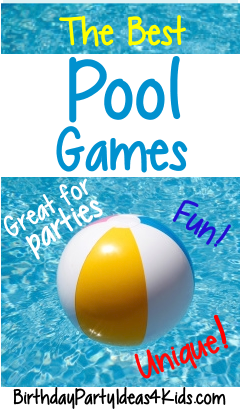 Easy and fun swimming pool party games for all ages. See our Pool Party Ideas page for more fun! One of my kids favorite pool games. Choose a person to be "it". "It" stands on the side of the pool with their back to the other swimmers who are lined up in the water on the same side of the pool as "it". Players choose a color and keep it to themselves. "It" begins to call out colors one at a time. If a players color is called out they must try and make it to the other side of the pool as quietly as they can. If "it" hears them swimming then they can dive into the pool and try and tag a player. If "it" turns around and the players still have a hand on the side of the pool then "it" must take a step away from the edge and start again. If "it" catches a swimmer then the swimmer becomes the new "it". Choose a person to be "it". They stand in the middle of the pool. Players line up on one side of the pool and try and swim to the other side without being tagged. The players who are tagged hold hands with "it" and for the next round all the players holding hands try and tag the swimmers as they try and make it to the other end of the pool. Keep going until all players have been tagged - then choose another "it" and start again. Lots of fun! Select 2 players to sit on a blow up raft in the middle of the pool. Give each one a pool noodle and have them joust with the noodles and try and get each other off the raft. The winner takes on the next player. Have fun inside and outside the swimming pool with these fun Pool Noodle Games . Choose someone to be "it" They close their eyes and try and tag the other players. Whenever "it" calls out "Marco", the players must answer "Polo". If "it" tags a player then that player becomes "it". If you allow players to get out of the pool while playing the game then if "it" calls out "Fish out of water!" and there is someone outside the water then that person becomes "it". If there is more then 1 person outside of the water then "it" gets to choose who takes their place. Players line up on the side of the pool and one person stands away from them in the water. All players must jump into the pool on the word "go". The person in the pool calls out "Jump!" or "Dive" and the players must try and obey the command while in the air. If they do the wrong command they must sit out. Use a splash ball or large sponge for "it" to tag other players. Throw the ball or sponge and whoever "it" hits becomes the new "it". Players form a large circle in the pool and scramble to collect ping pong balls and place them in their container. Dump a large container of ping pong balls in the middle of the players circle. Whoever collects the most balls wins! Have them collect them in different colored laundry baskets or buckets that are placed on the edge of the pool. Great for individual or team play. Variation: Before the party use a permanent marker to give each ping pong ball a point value. The team with the highest score wins. Or place a small colored dot on each ball in different colors. Teams must only collect the balls with their color. Dunk a 2 shirts in water and freeze in gallon size storage bags. During your birthday party take the shirts out and divide your friends into 2 groups. Each group is racing to thaw and put on the shirt. You can use anything in the yard to thaw it: hose, pool, slam it on the pavement, use your hands, breath on it, etc. Every 15 seconds you switch the person thawing the shirt. Have someone shout out "switch" every 15 seconds. The first one team to thaw it and puts it one one of their teammates wins. *This would be a great game to play while it is hot outside and before you play the Soaked Shirt Relay below. Fun pool game and relay for all ages. Teams line up on one side of the pool. They must put on a large t-shirt and swim to the other side of the pool and back. Then take off the wet shirt and the next player must put it on and swim to the other side of the pool and back. Keep going until all players have completed the task - first team done wins. The shirt is very hard to get on and off while it is wet. Variation: Add other items that the players must put on such as a diving mask, flippers, shorts, bathing cap, nose plugs, pool ring ... etc. Funny relay race for individuals or teams. Players must push a watermelon from one end of the pool to the other without touching the bottom of the pool with their feet. To make it extra difficult rub Vaseline on the watermelons to make them extra slippery. Choose a person to be "it". "It" tags players and once tagged the player must freeze where they are. Other players can unfreeze them by swimming under their legs. When all players are tagged then "it" chooses a player to be the new "it". See our whole page of water balloon games for kids. Played just like the basketball game H O R S E only using a water basketball hoop. Our favorite Splash and Water Games for swimming pool parties. Keep everyone cool with these fun games for all ages. Water balloons, squirt guns, hula hoops, pool noodles, and more of the best summer outdoor games. 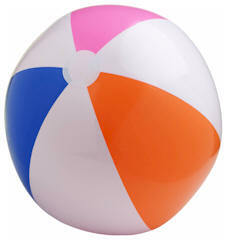 Send in your favorite fun pool games and we will add them to the website.